Homespun Stitchworks..... For the love of vintage: Great Day sorting..... only slightly distracted! Yesterdays sort out went well I can report to you!!!.... I only got slightly distracted and really you be the judge on this, it was the embroidery thread drawer!!! what is a poor woman to do? 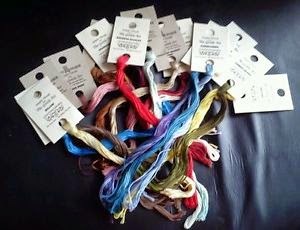 The colours of the hand dyed threads are outstanding and I was trying to put them in some sort of order. I only have one drawer for them so tried to tidy another drawer where some room could be in place for more. I am picking up my latest threads in a few weeks so thought it was an idea to make sure space was available to putting them away properly and with the care that they deserve. Things are a lot calmer in there with a basket out with my current stitching projects in them with the threads and fabric bits that are needed to complete them. This way less distraction going to the fabric drawer ( you can see my problem) Anyway fooling around aside it all looks tidy and organised again for my day to continue. I hope whatever you are up to today it is a good one...... Happy Stitching!